It’s the Wednesday before Thanksgiving, which means rather than spending time at work reading football articles, you’re likely off or traveling, so let’s not waste any time. Jumping right into it, here’s where the rookies stand through the first 11 weeks of the season in PFF’s season-long race for our Rookie of the Year award. Happy Thanksgiving! Among the 70 running backs who’ve seen at least 100 offensive snaps this season, Lindsay ranks eighth in terms of overall grade, and he’s one of just four running backs who currently own both rushing and receiving grades of at least 75.0. He’s tied for seventh among the 55 backs with at least 50 carries this season by picking up either a first down or touchdown on 26.0% of his carries, and he’s ninth among the same group with 20 rush attempts of 10 or more yards. As a receiver, he’s generated a 104.2 passer rating, the 13th best mark earned by a receiver with 25-plus targets this season. Among the 70 running backs who’ve seen at least 100 offensive snaps this season, Chubb ranks first among them in terms of overall grade, and he also leads the way with a 91.5 rushing grade. Chubb leads all running backs with a 131.9 elusive rating, Kareem Hunt is second with an elusive rating of 85.7, and there are only six other qualified running backs in the entire league who even have an elusive rating north of 70.0! Chubb leads all backs by averaging 5.4 yards after contact per attempt (no other running back is even averaging more than 4.0), and he also leads the way by forcing 0.28 missed tackles per attempt. It had been a three-way race during the first half of the season for top rookie running back honors, but after seeing an increased workload over Cleveland’s last four games, Chubb has loudly crashed that party. 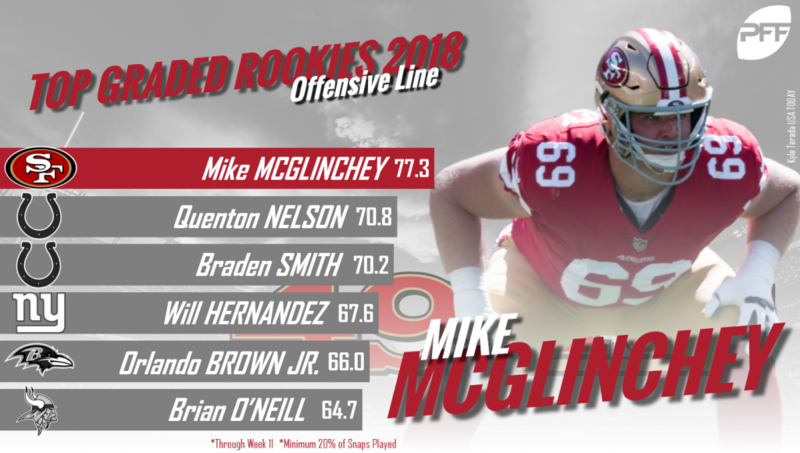 McGlinchey ranks 12th out of 86 qualifying tackles this season in terms of overall grade, and his 82.9 run-blocking grade doesn’t just lead all tackles, it’s best among all offensive linemen. McGlinchey struggled a bit initially in pass protection, but he’s surrendered no more than one pressure in five of his last six games.